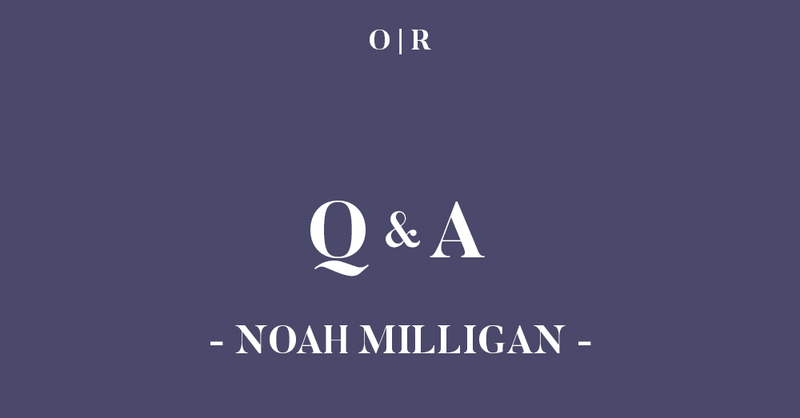 We're honored to feature "Proximate Contact" by Noah Milligan in Issue Two of Orson's Review, which will be released on March 19th, 2019. His acclaimed book of short stories, Five Hundred Poor, will be released on June 1st, 2018 by Central Avenue Publishing. We're also very fortunate for the time Noah took to sit down and chat with us about his journey as a writer. *The following interview involves Orson's Publishing (OP) and Noah Milligan (NM). NM: I credit my mother for passing down her love for reading to me when I was very young. She was always reading a book. She loves philosophy, theology, and history, but would also read some fiction. Some of my earliest memories are of me and my mother in a small, independent bookstore in Bartlesville, Oklahoma, this oil and gas town just south of the Kansas border. I would play on the floor, sometimes take a nap tucked away in one of the aisles while my mom shopped for hours. I always felt so much at peace there, and I think maybe these subtle clues rubbed off on me. Always seeing my mother with a book, spending long blocks of time at bookstores, it made me, too, fall in love with books. To this day, I’m most comfortable in my office, surrounded by my books. It’s like being with friends I don’t necessarily have to talk to. And as an introvert, I especially appreciate that. NM: It’s not. Like most writers, I have a day job. I work as a commercial loan officer for a small, community bank in Oklahoma City. I know bankers get a bad rap, and rightly so. There are some greedy, unethical bankers out there. I think a lot of that stems from having these large, money center banks out there that yield too much power. We’ve got these behemoth financial institutions that are, literally, too big to fail. I know it’s a cliché, but it’s true, and unfortunate. Capitalism, through its innate properties of consolidation and monopolization, has created this mutually assured destruction. If these institutions fail, we risk the complete annihilation of our economy. And they have held us hostage to this through the bank bailouts after the subprime mortgage crisis, through their continued efforts to defund the CFPB, and to deregulate. I’m certainly not smart enough to have the answers to fix this, but I think community banking could be a part of the solution. We bank individuals and small businesses located within our community. Our interests as bankers are intrinsically tied to the community we serve. If the community thrives, then we too can thrive, and that’s what banking should be about. Not sales figures. Not market share. Not political influence. But the wellbeing of the local community. That probably sounds stupid and too idealistic to ever come to fruition, but, hey, it’s what I believe. OP: What about "Proximate Contact" are you most proud? NM: This is a difficult question for me to answer. I’ve always had a hard time talking about my writing. I’m sure the question is meant to pinpoint some element of craft, but I don’t think that’s the right answer for me. I think I’m most proud of the fact that it just exists. I’m thankful I can carve out a little time each day to do something I love and that a few people might elicit some joy from a story I wrote. NM: Ah, man. This is another hard one for me. I suppose I do in some sense, though it’s just something that formed out of trial and error rather than something I consciously set out to do. The most important part, especially for the first draft, is just to write every day. My goal is to hit at least 500 words, and if I write more, then it’s a really good day. It doesn’t even matter if what I’ve written is good or not, which most of the time it’s not. It’s just important to get the first draft done. After I write the first draft, I usually let it sit for at least a week. Then I’ll print the story out and read it aloud, marking passages that don’t work, and then rewrite it. Through the first several drafts I’m mostly concerned with structure and character development, and then once I start feeling pretty good about those, I’ll delve into line edits, making sure every word is needed to push the story along. I’ll repeat those steps until I think I have a draft that I’m not too embarrassed to start sending out into the world. NM: I’m from Oklahoma, which is right in the heart of tornado alley, so I wanted to be a meteorologist growing up. More precisely, I wanted to be a storm chaser. I’ll never forget the first time I ever saw a tornado up close. I was in middle school at the time, and my family lived a few miles out of town right on Grand Lake. I was in my brother’s truck, and it was just me and him, and we were heading home from somewhere, I don’t even remember where, but a storm popped up out of nowhere. We were on this hilly road right by the lake, and this water spout spun out of the sky about a hundred yards west of us. The wind was violent, and so my brother stopped the truck, and we could see the tornado approaching. Small branches whipped around us, and the trees bent over the road. Within a matter of seconds, it was crossing the road about twenty yards in front of us. The funny thing was, I wasn’t all that scared. I was a little, of course, but I was excited more than anything. It pushed the truck around, and we spun into the ditch. But then it was over. The tornado dissipated, and the street was covered in debris, and my brother and I got out of the truck and celebrated like we’d just won something. Ever since, I’ve been fascinated by tornados. They’re just these awe-inspiring, rapturous, yet disastrous phenomenon, so, they pop up quite a bit in my writing. In my first novel, An Elegant Theory, the protagonist’s father is a storm chaser, and a major determinant of their relationship happens when the father, his assistant, and the protagonist are chasing a large tornado. In my upcoming novel, Into Captivity They Will Go, a miles-wide tornado plays an important plot point after it ravages the town. And I’m sure tornados will continue to pop up in my fiction. I just hope they don’t become a crutch that I lean upon to move the plot forward. NM: Time with my children. Without a doubt. Writing is an impulse. An addiction. I love it. My identity is inexorably wrapped up in being a writer. But this also comes at a cost. I have to work. I have to write. And this means less time to spend with my kids. And this absolutely kills me. I feel like a monster because of it. And sometimes the regret and guilt become overwhelming. It’s difficult to be able to find that balance. And I’m still trying to find it. Right now, as I’m typing this, my six-year-old and two-year-old are playing out in a kiddie pool in my backyard, and instead of playing with them, I’m in my office. I try to tell myself it’s okay. Later today, I’m taking them to Chuck E. Cheese because they love it, and tomorrow we’re all going to the zoo, but that doesn’t change the fact that I can hear them laughing, and I’m not there to laugh with them. NM: Right now, about 15 or so. Used to be a lot more. Before kids and a career, I read probably three dozen a year, but there just doesn’t seem to be as much time in the day anymore. NM: I do attend readings, as many as I can anyway. Not sure I can pinpoint a best, though. Here in Oklahoma, we’re blessed to have some great writers. Last fall, I was completely blown away by Todd Fuller reading from his poetry collection To the Disappearance. Recently, I got to hear Brandon Hobson read from his novel Where the Dead Sit Talking, and it’s just such an amazing book about the foster care system here in Oklahoma. Another favorite is Jeanetta Calhoun Mish reading from her book of essays Oklahomeland. Then there’s Constance Squires reading from her novel Along the Watchtower. And I can’t forget Rilla Askew reading from her book of essays Most American. They’re all just fantastic, captivating readers and writers. There’s just no way I could pick a best. NM: Acceptance? Support? To feel like I belong? But isn’t that true of any community, literary or not? I think what’s most important for me to focus on is what I can do for my literary community. And I need to do better. I need to attend more readings. I need to buy more books. I need to tell more people about my friends’ and colleagues’ books, recommend them to strangers in an elevator and invite a friend to a reading that wouldn’t normally go. I need to host readings. Organize workshops. Find a way to help in any way that I can. It’s an ongoing commitment, always evolving, but the most important thing, I think, is to continue to strive to do better. If I do that, then I think acceptance and support will be the inevitable byproduct of me giving to my community. NM: Nah. Not really. I think it helps. It can introduce you to a literary community that you might otherwise not come across and teach you elements of craft that maybe would’ve taken longer to figure out on your own, but I wouldn’t call it crucial. More important, I think, is to read well (and a lot), determination, and luck. NM: Just to continue to write better. Of course, I’d love to have amazing critical acclaim and commercial success, be able to quit my day job, get a movie deal or a Netflix series or something, but I decided long ago not to measure success in those terms. I want to write quality fiction. If I do that, then I’m happy. NM: I really haven’t thought much about it, in terms of my own writing anyway. I try to focus on the project I’m working on at the time, without thinking too much down the road. Once I finish a story, I try to find a market where it fits, submit it, and sometimes they’re published and a lot of times they’re not. With my books, I’ve been blessed to find a wonderful independent publisher, Central Avenue Publishing, whom I hope to continue to publish with for many years to come. My editor there, Michelle Halket, is just a phenomenal person who cares deeply about literature and her writers. I’m about to publish my second book with her, a short story collection called Five Hundred Poor. It’ll be released on June 1st, 2018, and I couldn’t have asked for a better experience. One exception is I do have a long-term goal to start a non-profit literary center here in Oklahoma City. The mission would be four-pronged: provide literary workshops to college and high school students led by established writers, literacy programs for underprivileged youth, a mobile library for underserved areas, and a curated bookstore that only sells titles published by small independent publishers. It’ll take quite a bit of capital to get it started, but I think it would be worth it. Noah Milligan's debut novel, An Elegant Theory, was shortlisted for the Horatio Nelson Fiction Prize and a finalist for Foreword Review's 2016 Book of the Year. He is a graduate of the MFA program at the University of Central Oklahoma, and his short fiction has appeared in Windmill: The Hofstra University Journal of Literature and Art, Rathalla Review, MAKE Literary Magazine, Storyscape Literary Journal, and elsewhere. Noah's acclaimed collection of short stories, Five Hundred Poor, will be released by Central Avenue Publishing on June 1st, 2018. Connect with him at www.noahmilligan.com. Be sure to check out Noah’s latest story in Issue Two of Orson’s Review.